As we get older the aging process is more noticeable as we greet another wrinkle here, an ache and pain there, and the need for a variety of eyeglasses because our vision continues to worsen. Vision loss affects every part of our eyes from a decreased pupil size to eye concerns such as glaucoma and cataracts. Our eyes are aging and the amount of light we are able to let in changes — requiring more light for our daily activities. So, how can you work with light as you age? At Shelby Design Center, we take into consideration all of our clientele, including those of a certain age! We want to guide you in crafting a space that is both inviting and well-lit enough to avoid eye strain and headaches, so you can continue to enjoy your day-to-day activities. Find ways to increase the lighting in your home in today’s post! Living independently for as long as possible is probably the first thing to top our list as we begin to age. We want to be able to move about our day freely, being able to cook, clean, and run errands. Interior lighting, as small of a gesture as it seems, can increase safety and independent living for seniors. The right kind of general, task, and accent lighting can make navigating the home secure while helping to prevent trips and falls and can easily take independence away. Think of how task lighting in the kitchen can help you to read medicine labels correctly or wall sconces to help guide you to the bathroom in the middle of the night — lighting is your ticket to accident prevention! Seniors, as a result of aging, require more light in general because of eye changes — more light is required than the same level as it once was with less light. 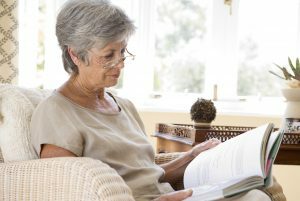 How can home lighting help seniors? Although what is considered “warm” lighting — the lighting with a buttery, cozy glow — is inviting and comforting, it is actually less perceived as bright light than what is considered “blue” light. 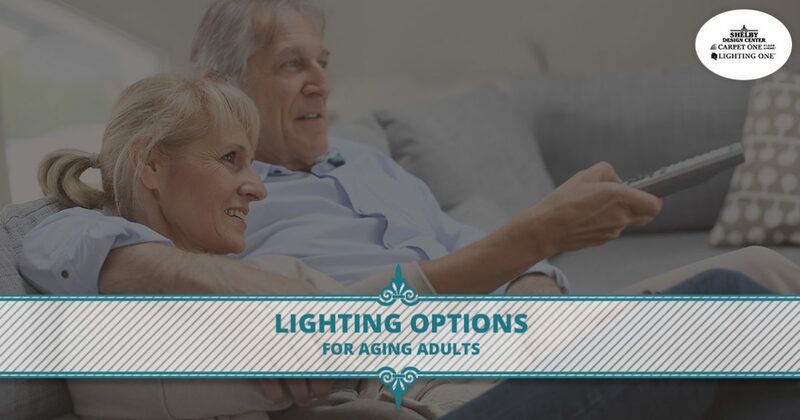 Blue light and cooler tones, mimic daylight and is easier for seniors to see, so replacing light bulbs with fluorescent or halogen bulbs can give aging eyes a boost. Task lighting is perfect for projects and tasks that require a central, focused light. An optimal way to get more task lighting, is to assess each room and what you do in each one. Do you cook a lot and need task lighting so you can better see what you’re preparing, or do you spend a good deal of time reading and doing puzzles, a lamp with a swinging arm is needed? Take inventory and create a task-lighting oasis in each room! Because aging eyes are sensitive to the light levels, installing dimmers to general lighting and investing in floor lamps with dimmers is a great way to control the lighting levels in each room. A new modern lighting design can take your home to a whole new level and increase its safety to adapt to changing vision. 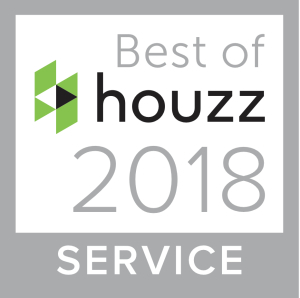 To learn more about how our home lighting can improve your home, reach out and connect with us today!